This is an illustration of the concept of the holography. Physicists and mathematicians have long sought a Theory of Everything (ToE) that unifies general relativity and quantum mechanics. General relativity explains gravity and large-scale phenomena such as the dynamics of stars and galaxies in the universe, while quantum mechanics explains microscopic phenomena from the subatomic to molecular scales. The holographic principle is widely regarded as an essential feature of a successful Theory of Everything. 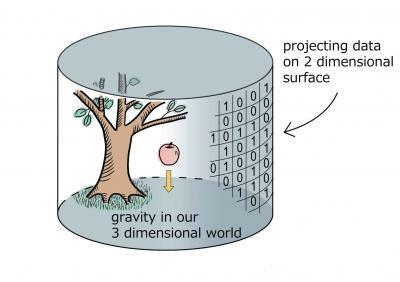 The holographic principle states that gravity in a three-dimensional volume can be described by quantum mechanics on a two-dimensional surface surrounding the volume. In particular, the three dimensions of the volume should emerge from the two dimensions of the surface. However, understanding the precise mechanics for the emergence of the volume from the surface has been elusive. Now, Ooguri and his collaborators have found that quantum entanglement is the key to solving this question. Using a quantum theory (that does not include gravity), they showed how to compute energy density, which is a source of gravitational interactions in three dimensions, using quantum entanglement data on the surface. This is analogous to diagnosing conditions inside of your body by looking at X-ray images on two-dimensional sheets. This allowed them to interpret universal properties of quantum entanglement as conditions on the energy density that should be satisfied by any consistent quantum theory of gravity, without actually explicitly including gravity in the theory. The importance of quantum entanglement has been suggested before, but its precise role in emergence of spacetime was not clear until the new paper by Ooguri and collaborators. Quantum entanglement is a phenomenon whereby quantum states such as spin or polarization of particles at different locations cannot be described independently. Measuring (and hence acting on) one particle must also act on the other, something that Einstein called “spooky action at distance.” The work of Ooguri and collaborators shows that this quantum entanglement generates the extra dimensions of the gravitational theory.